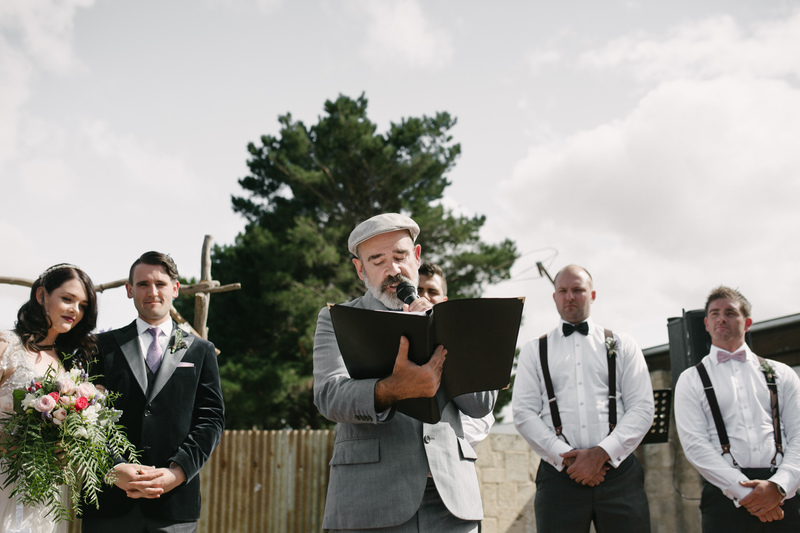 I have shot a few weddings alongside Sean (Marry Me Sean) as the celebrant. He is always a joy to work with. So I thought I would ask him a few questions to get a better understanding into his line of work. Sean, I would love to know, what is a wedding to you? A wedding is a celebration. Pure and simple. It’s one of the few chances you get in life to much such a public declaration of your love for another human being. And not only a public declaration but your audience is usually the people that mean the most to you in your life too. I always tell my clients who often get a little a nervous before a wedding, don’t worry! This is the most supportive, giving and generous audience you can ever have. They are totally here for you. Nothing can really go wrong, because if something doesn’t go to script, and it often does, then the guests will just laugh it off. It’s the best job in the world. Seriously. It is SO rewarding. And I feel I quite blessed to be such an integral part of a really important day in people’s lives. It’s going to sound corny but I really feel like this is a job I was meant to do. I probably wouldn’t be doing it at all though if not for the incredible generosity of my friends. I’ve been a celebrant about two and a half years now. But it was about ten years ago that I first considered becoming a celebrant. I’m also a poet and at the time I was hosting a lot of poetry gigs, so I was no stranger to public speaking and hosting events. I went to a couple of weddings at the time and the celebrants I saw were really boring, with no presence or personality. A celebrant drives the whole ceremony so if they’re not bringing much to the table then chances are you will have a fairly dull ceremony. It suddenly occurred to me that I could do that! A celebrant is basically MCing an event, which I was doing a bit of at the time. I started telling my friends I was thinking of becoming a celebrant and everybody I mentioned it to said I would be perfect at that. To become a celebrant you have to get a Cert IV in Celebrancy, which costs around $1500 or so depending where you go. Now I just never got my act together to raise the money and I think my friends kind of got sick of hearing me talk about it. So around three years ago it was my birthday on New Years Day. I had been to a crappy New Years Eve party and I was riding my bike home alone at 4 in the morning. One of my friends called me up and told me that when I got home I should look up a website called Marry Me Sean. I didn’t know what the hell was going on, I thought ‘is somebody proposing to me!’ But when I opened up the site I pretty much burst into tears as a bunch of my nearest and dearest friends had all pitched in to pay for my Marriage Celebrant’s course as a birthday present. And on the site they had all posed for photos holding up signs saying ‘Marry Me Sean.’ So that was why I decided to call my business Marry Me Sean. And it has literally changed my life. I was feeling a bit lost at the time career wise and now I have a job that I adore doing. All thanks to my wonderful friends. I have shot a wide range of weddings and you are often the celebrant! How do you book such amazing weddings? Good question. I don’t know. Build it and they will come? I’ve been extremely lucky with the amazing bookings I get. I guess I see that as another sign that I was meant to do this. Most of my bookings come from word of mouth. People see me do a ceremony and they recommend me to their friends. My very first ceremony was in Margaret River in WA! I had never even been to WA before. A beautiful couple, Haslett and Kate who I didn’t even know really (we’re great friends now), but they had seen me perform poetry before, heard I was getting my licence so they booked me before I was even fully qualified. My qualifications only just become official a few days before the ceremony! They flew me over for it and everything. Since then I have also performed weddings in Adelaide, NSW and Brisbane! This was a wonderful surprise and I only thought I would be performing weddings in Victoria. When I did the course our tutor warned us that the average celebrant only performs about 6 weddings a year, it’s a very competitive market. In less than three years I have already performed around 60. It just seemed to gain momentum very quickly. I’ve done some really quirky ones too. I did a wedding in Fitzroy that was also a theatre show that anybody could attend! And I did that dressed as an astronaut! I also did an Alice in Wonderland themed wedding. The bride was dressed as Alice, the groom as the Mad Hatter and all their guests dressed to theme too. The couple requested that I dress as the White Rabbit and to keep in theme they wanted me to arrive late! It’s the only wedding I’ve been late to and it was by request! It was at Flinders Beach. So I had to set up the PA on the beach, then run off and get changed into my white rabbit costume and then hide in the dunes and wait for everybody to arrive. When they were all in place I came out the dunes in my costume saying ‘I’m late, I’m late for a very important date!’ It was SO much fun. You seem to bring a great mix of professionalism and quirkiness to weddings, how do you do this so well? As I mentioned before I do have a background in public performance as a poet. But having said that I don’t go too over the top, I have seen celebrants who make it too much about themselves. I fully believe that the rock stars of the day should be the bride and groom. I believe in making it as joyful as possible and to try and reflect the personalities of the couple as much as possible. I think it’s important to be reverent and sincere when appropriate but mostly it should be about joy, about putting smiles on peoples faces, both the bride and groom and the guests. 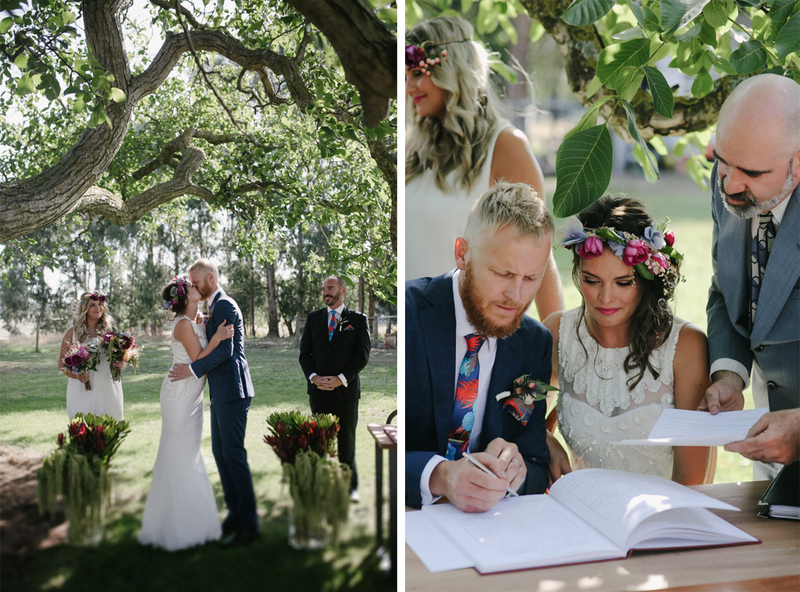 Do you have any tips for brides that have just started looking for their perfect celebrant? Find somebody you can relate to. Find somebody with personality. It’s all well good if they are extremely well organised with a twelve point checklist and all but to have a successful ceremony, that you and your guests will remember forever, it’s important that you find a celebrant that you have some kind of chemistry with. I never ask for a commitment from my clients on our first meeting, I always tell them to go away and discuss between themselves if they think I’m a good fit for them, because it’s really important. If you could give every bride just one piece of advice, what would it be? To make sure to take a moment before the ceremony begins and make sure you are in the moment. Make sure you enjoy the ceremony AS IT IS HAPPENING. To do this you have to forget about everything else and just be present and in the moment. The ceremony will go very quickly, it’s over before you know it. There is so much build up and planning beforehand it’s such a shame if you spend the ceremony thinking about what wasn’t done in time or about what is going to happen at the reception. None of that is important in that moment. I tell my clients to make sure you look around you at your guests and see their beaming faces and feel the love. Because that’s what the day is all about. LOVE. Is there anything that ever goes wrong on a wedding day that could easily be avoided? Well as I said before. This is the most supportive audience you’ll ever have so if ever anything doesn’t go as planned I think a good celebrant will just laugh it off, make a joke and move on. But one thing I do heartily recommend is a rehearsal, that’s the best way to achieve a smooth sailing ceremony. I don’t go through the whole ceremony at my rehearsals because I want some spontaneity and authenticity. So I just go through the start of each section so we know where everybody will be standing, when the music will come on, etc. Just be prepared, but also don’t be a slave to procedure and know that it doesn’t matter if things don’t go exactly as planned. The people that love you the most in the world, your guests, will see you through. And don’t worry if you get a little emotional, it’s a completely natural thing to do at a wedding! What has been your favourite song someone has walked down the isle to? Xanadu by Olivia Newton-John was pretty special! What music would we typically find playing at your house on your day off? A very mixed bag. Before I became a celebrant, I worked in record shops for twenty years and I also still DJ around town a bit. So everything from country to 80’s classics to soul/funk to electronica to ambient to 90’s to banging R’nB and hip hop! I have very eclectic tastes. I would just say that the most important thing is to make your wedding your own. The beauty of the civil marriage ceremony is that there is very little you have to do to make it legal. There’s just a few lines the celebrant has to say, everything else is completely up to you! Some people want a very high energy ceremony, some people want something small and relaxed and both ways is perfectly fine. As long as it’s what you want. Don’t feel bound by tradition, try to put your own stamp on it. You’re in charge! And find a celebrant who won’t get in the way of that and will do their best to facilitate the best day of your lives.